Some of the priory's manuscripts would have been richly decorated, but many others would have had modest decoration, like this one. They were books for study of subjects like theology for which illustrations were unnecessary and which would not have been displayed in church services or to important visitors. 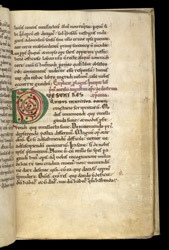 On this page of 'On Christian Doctrine', the rubrics--or writing in red--in the middle of the page indicate the end of the prologue and beginning of the book's first section, which starts with a large letter decorated with colour. The reverence for the author and his topic are evident from the skillfully executed handwriting and careful page layout.